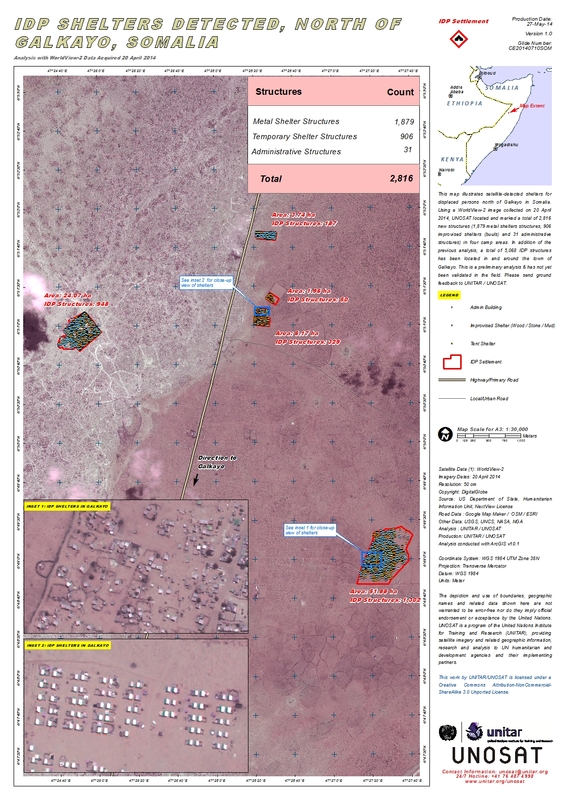 This map illustrates satellite-detected shelters for displaced persons north of Galkayo in Somalia. Using a WorldView-2 image collected on 20 April 2014, UNOSAT located and marked a total of 2,816 new structures (1,879 metal shelters structures, 906 improvised shelters (buuls) and 31 administrative structures) in four camp areas. In addition of the previous analysis, a total of 5,068 IDP structures has been located in and around the town of Galkayo. This is a preliminary analysis & has not yet been validated in the field. Please send ground feedback to UNITAR / UNOSAT.